Recently I went to Thrifty Foods here in Victoria – once a local supermarket chain, now owned by Sobey’s in eastern Canada. I usually go to locally owned stores but I was looking for something our local shop did not have. When I made my way through the produce display I found tomatoes from three countries. Near Victoria and within 100 km. there are many greenhouses; at this time of year tomatoes of different kinds are on sale from these sources, some are ‘organic’ and labelled according to known Canadian standards. The cheapest tomatoes come 2000 km. by truck from Mexico where land and labour are cheap. 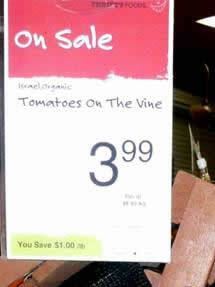 The most expensive tomatoes, billed as ‘organic’ are from Israel, 11,000 km. away. So on environmental grounds alone our local tomatoes are the best purchase. They don’t travel very far; we have abundant water supplies in this part of Canada. Mexican tomatoes are dubious – all those trucks roaring up the Pacific coast of Mexico and USA, no idea who owns the fields and greenhouses, no idea what chemicals are used there, how clean the water used is or if labelled ‘organic’, just what standard that implies. Our knowledge of health and labour conditions there and of the depletion of water resources in a semi–arid area is scanty. 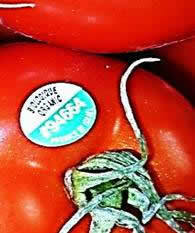 Now look at Israeli tomatoes! They are flown 11,000 km to get here, the most unsustainable way to move food around. True these ones were labelled ‘organic’ but some Israeli tomatoes are not so labelled – and we don’t know what Israel means by that term either. The key words here are government support and water. Neither Canada nor Mexico subsidize their farmers, but how else could tomatoes, albeit expensive ones, be flown from Israel 11,000 km, unless the producers were subsidized? And in an arid region with low rainfall, the water required for tomato production has to come from somewhere. The concern for environmental, labour, and health standards is a much needed ethical issue for many consumers in this part of the world. So maybe Israeli tomatoes cannot be considered environmentally acceptable; but can they really be called ‘weapons of war?’ Tomatoes have been used as non–lethal weapons to harass and humiliate politicians and unpopular figures, but they are hardly a sophisticated weapon and damage little except dignity. In 2010, Israel exported $7.2 billion worth of lethal military hardware ($6.9 billion in 2009) making Israel one of the four major arms exporters in the world, but we don’t find rocket launchers and drones in the supermarket. The people in Gaza get them free from the sky and live and die with their destruction. Tomatoes are part of the much smaller but significant agriculture exports; around 4% of total Israeli exports every year. However, these visible consumer exports – from oranges to dates to couscous to halva to tomatoes – are part of Israel’s image as a normal world economy, in our faces in the marketplace; making people in Europe and North America aware of Israel’s presence, not as arms exporter, but a food exporter; hence the important of government support for such an unlikely product in our grocery store; a weapon of normalization at a time of war. The need for water for these crops introduces the hidden weapon of war in tomatoes; a war against the environment. Israel has channeled and drilled for water all over its claimed land and now is building illegal colonies, 172 at last count, in Palestine’s West Bank. Palestinians, desperate to increase their agricultural capacity are not allowed to drill new wells or construct dams. Many Palestinians only get domestic water several times a week; homes and farmers often must buy water from Israel at grossly higher prices than Israelis pay. Colonies flaunt swimming pools and mansions while Palestinians face the destruction of their homes and environment and the ongoing theft of their water resources, orchards and farmland. Jordan River is neither wide nor deep, as the song says. By the time it passes under the Allenby Bridge border crossing near its end in the Dead Sea it is an almost invisible trickle; Israel has siphoned off most of its previously robust flow. Levels of the Dead Sea have steadily dropped for the last thirty years, reflecting this upstream diversion for irrigation. The occupation is the real war and the tomato is just one more weapon in the war of occupation which is both a war on the Palestinian people and on the environment. The solution? Boycott all Israeli products and products of companies that cooperate with Israel. Shop local and shop ethically. Get active and get informed. Be vocal. I am telling the management at Thrifty Foods I won’t return until it is an Israeli product-free zone.